At the age of 14, Lise de la Salle's first recording (Ravel, Rachmaninov) marked the start of her collaboration with Naïve. In 2004, her second album (Bach, Liszt) was named CD of the Month by Gramophone. This was followed in 2007 by a third CD, the First Concertos of Shostakovich, Liszt and Prokofiev with Lawrence Foster and the Gulbenkian Orchestra, which won the same distinction in Gramophone. In 2008 came a double album of Mozart and Prokofiev, featuring a DVD (Lise de la Salle, Majeure!) directed by Jean-Philippe Perrot, which was named Editor’s Choice in Gramophone and BBC Music Magazine Choice. The year 2010 saw the release of a Chopin recording, featuring the Second Concerto with the Dresden Staatskapelle under Fabio Luisi, and the four Ballades. 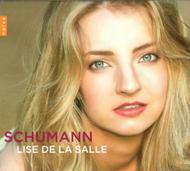 The most recent additions to her discography are a Liszt programme and 'Lise de la Salle: A Portrait'. "I’ve always listened to a lot of Schumann. He fascinated me when I was a little girl of six or seven. I’ve always been attracted by the manic side of him, his very individual ‘touch’, and I’ve always loved surrendering myself to his music. I feel very close to it. But although Schumann is one of the composers I get most out of, I waited a long time before I played him ‘seriously’... I think I didn’t want to risk being disappointed by myself. I couldn’t bring myself to imagine that everything I had dreamt about this music might not take shape exactly as I wanted. So I waited until I was completely ready, and that moment came a few years ago. The Fantasie was the apotheosis of those dreams of mine. So I built this programme around it.